Marshes, disturbed bogs, shaded springy sites. Swamps, meadows, swampy woods, shores, and thickets. Moist lowlands. 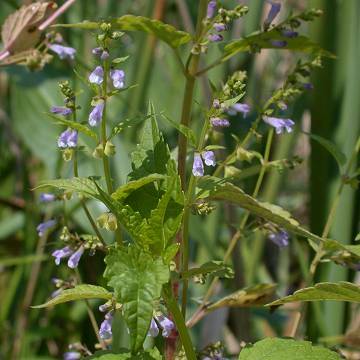 Grows with Scutellaria epilobiifolia in bogs. Newfoundland west to British Columbia, south to GA and CA. Rhizomatous, herbaceous perennial. Stems and leaves glabrous or glabrate. Leaves opposite, ovate or lance-ovate, with broadly rounded or subcordate base, toothed, to 8 cm long and 5 cm wide. Racemes mostly axillary or on axillary branches to 10 cm, bracteate but scarely leafy except sometimes near the base. Flowers small, up to 8 mm long, usually less, numerous in one-sided, mostly axillary, racemes, the bracts much reduced, not at all resembling the foliage leaves; calyx tube with a protuberance on the upper side; corolla blue, occasionally pink or white, to 8 mm long, the short galea evidently surpassed by the lower lip; ovary deeply 4-lobed, fruit separating into 4 1-seeded nutlets. The flowers of this species are much smaller than those of S. epilobiifolia and occur in lateral racemes arising from the leaf axils. and Adjacent Canada. Second Ed.